ICE is negotiating with the village of Crete and Corrections Corporation of America to build a new Immigrant Detention Center, a prison with the capacity to incarcerate 700-800 immigrants, just South of Chicago. The contract has not yet been signed – and until it is, this new prison can still be stopped. This is a call to action! 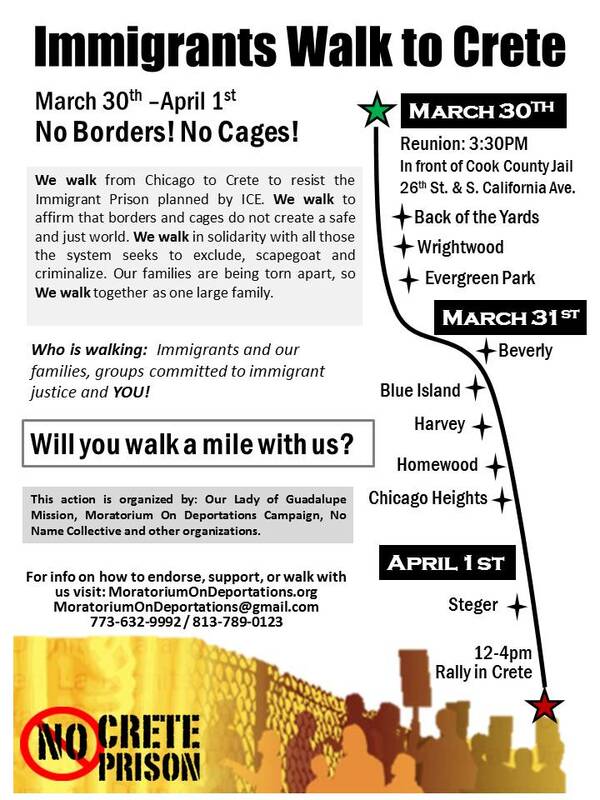 Join us for a three-day walk as we oppose the new detention center and demand an end to the criminalization of our communities! Walk a block with us, walk a mile with us, join us for a stop along the way, or meet up with us in Crete. Check back often for daily updates on the route and schedule! Also please see information and logistics for walkers and how else you can support. – No detention of immigrants – not in any back yard! – Our families are being torn apart, so we walk together as one large family. – The walk is a expression of the experiences of communities who have been criminalized – we are committed to immigrant justice and to full human rights, full dignity, for all. We do not accept the division of good immigrants vs criminals. – Detention is about dividing society into prisoners and their jailers. Creating an incarceration nation will devastate all our communities. We refuse to be the captives, and we refuse to be the captors. There are many ways you can participate or show your support for this action and join the fight against detention. – Use your networks to spread the word about the struggle against detention. Distribute information about the action as broadly as you can. Hold a meeting to inform your community about detention. – Make a small donation, cash or supplies, by mail or deliver (daily, 9AM-6PM) to: Our Lady of Guadalupe Mission, 3442 W 26th St, Chicago. See contacts, below. – Walk a mile with us or join us for gatherings along the way – please see route and schedule, and check back often as we add more details (locations and times) for stops, meeting points etc. – Join us for the rally in Crete: April 1, 12 PM – gather in Crete Park (corner of Main St and 1st St); 1-4 PM procession through Crete. – Rise up, rise up!